If you are confused about the many wine terms being used, here you will find a wine glossary that will greatly help you. In this page see wine terms from F to M.
Describes a wine that fills the mouth. A full-bodied wine. The process when the yeasts convert the sugar in the grape into alcohol. A device that removes yeast cells and other particles from the wine in order to clarify it. Many believe that too much filtering is detrimental to the wine. A process used to clarify wine where a substance is used, such as gelatin, egg white, bentonite, etc. When the substance settles to the bottom of the vessel, it carries with it sediment and particles. As with filtering, many believe that too much fining will strip the wine of texture and taste. The taste that a wine leaves in the mouth after it has been swallowed. A finish may be long, meaning it lasts several seconds, to non-existent. It can also be quite rough, or very smooth. The best wines have a long and balanced finish. A wine that lacks acidity. It is dull rather than lively. A term that describes a “stoney” flavor. Associated with grapes that have been grown in limestone rich soil. Describes flavors and aromas reminiscent of flowers. Usually associated with white wines. A wine that has had alcohol added in the form of brandy made from grapes. Examples of fortified wines are Sherry and Port. A wine with a lively acidity, the opposite of flat. Most associated with white wines. A wine with flavors and aromas reminiscent of fruits such as fresh grapes, peach, apple, etc. A wine that feels heavy in the mouth. Most full bodied wines are high in alcohol levels. A by-product of fermentation that has a slight sweet taste and adds texture to the wine. To splice one grape variety onto the root-stock of another variety, often more disease resistant. Flavors and aromas of a wine that are reminiscent of cut grass, hay, or herbs. Sauvignon blancs are often associated with this aroma and flavor. Flavors and aromas associated with grass, moss, or vegetables. In a white wine, such as sauvignon blanc, it is a positive characteristic. In red wines, it is considered a negative characteristic. Flavors and aromas of a wine that are reminiscent of herbs. An unbalanced wine, where the level of alcohol is higher that the acidity and fruitiness. It is associated with a slight burning sensation in the mouth. A gelatinous substance extracted from some fish. It is used to clarify wine. Aromas and flavors reminiscent of berries and jam. Usually associated with full-bodied wines. Red zinfandels are often described as “jammy”. Residual yeast particles that settle to the bottom of the container after fermentation. When a wine is left in contact with its lees, it acquires complexity and depth. Terms that refers to the liquid rivulets that run slowly down the inside of the glass after the wine has been swirled around. The effect of legs is determined by the amount of alcohol, glycerol, and other elements. Contrary to popular myth, it has nothing to do with the quality of the wine. A term that describes a wine that leaves little weight in the mouth. It can be compared to drinking skimmed milk, rather than heavy cream. Usually, light-bodied wines are low in alcohol. A term that describes a wine that has acquired a distinctive brown color because it has been oxidized and exposed to heat. The term comes from the Madeira wine, but is a negative characteristic when the wine is a table wine. A 1.5 liter bottle, which is the equivalent of two regular bottles of wine. Occurs when sharp malic acid is converted into the milder lactic acid. It can occur naturally, or it can be induced by the wine maker. Most, if not all, red wines go through this process, while some white wines do. A method of making champagne and other sparkling wines. It is very labor intensive. In this process the wine goes through two fermentations, one in the barrel and the second one in the bottle. 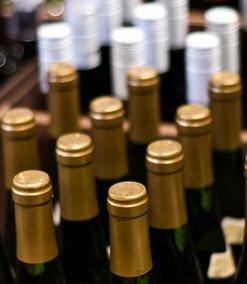 The bottles are stored up-side down so that the solids from the wine can settle in the neck of the bottle. The bottles are riddled (see riddling), and then the solids are removed. Wines that are made in the style of, and are blended from grapes used in Bordeaux. The flavor and aroma of a wine that suggests minerals, rather than fruits or herbs. The juice and pulp produced by crushing grapes. The must will then be fermented to become wine.